I'm a big fan of REN skincare and regularly recommend it to friends so I was excited to try REN Jojoba Micro Bead Purifying Facial Polish. It's a creamy formula with small jojoba oil beads which makes for a gentle exfoliation, ideal for those with sensitive skin (I've previously raved about the REN Micro Polish Cleanser which is particularly good for those with hyper-pigmentation, however, this would be a better choice if you suffer from sensitivity). I found the menthol fragrance invigorating but not overwhelming. My skin felt soft & smooth following use and as with all exfoliators, I found that my other products applied better. At £18 for 150ml, it's by no means a cheap product, however, I feel that the price is justifiable given that a little goes a long way together with the fact that it truly is a good quality product. 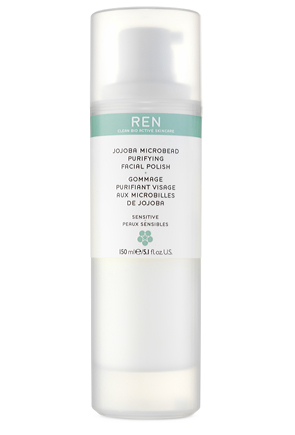 I really liked REN Jojoba Micro Bead Purifying Facial Polish and would recommend it.